Vintage Homes of Denver enjoyed seeing the transformation and remodel of this Highland’s property at 3106 Perry St. It went from a run down, as-is property to a beautifully restored 1910 Bungalow. It is the perfect combination of preserved character with attention to detail and modern updates. This house featured a restored front porch, all new landscaping, in-ground sprinkler system, large deck, new re-decked roof, and full brick and paint restoration. The interior featured an open floor plan, restored hardwood floors, doors, and trim work. The modern design of the bathrooms and kitchen featured carrara marble countertops, euro cabinets, stainless steel appliances, and designer fixtures throughout. Both the main floor and basement bathrooms were completely new and had custom tile and amenities. The home had new insulation, wiring, plumbing including sewer line, new furnace, and a new hot water heater installed. The basement was professionally finished with a lowered floor and high ceilings. All walls in the basement were brand new creating a bedroom, bathroom, and a loft style living space. The plaster was a smooth coat finish and period correct. The private back yard and restored front porch make for great entertaining spaces. A quick walk to the restaurants and shops on 32nd Ave. make it easy to take advantage of all The Highlands has to offer. This is a project we were proud to be a part of. Please watch our YouTube video on this property. Some of the few Hot Spots in Highlands include: Trattoria Stella, Mead St. Station, bang!, Happy Cakes Bakeshop, and Pinche Tacos. This is a neighborhood that has come along way and is thriving. For more information about listings available in the Highlands or surrounding Metro Denver Neighborhoods, please contact Jesse Sehlmeyer at 303-564-2245. Known to history as Highland, this community was once the Arapahoe Indians’ winter camp and a stage stop en route to the mining camps. Not to be confused with the later Highlands neighborhood to the northwest of Denver, or Highlands Ranch to the south, Highland was a brief chapter in the life of the adolescent Denver. The first townspeople in the Highland neighborhood were primarily English and German. The German immigrants were in search of work, and the brewery business was booming. Established in 1859, the Rocky Mountain Brewery called Highland home. Being the first brewery between the Mississippi River and the Pacific Coast insured prosperity for the owners, John Good and Philip Zang. Originally delivered by Zang himself with his trusty wheelbarrow, the brewery soon was producing enough to show a profit. Zang sold his share of the business in 1889, but the company continued to flourish and was putting out 175,000 barrels daily by 1917. While the brewery suffered from several fires and is no longer a piece of Denver’s skyline, the Zang mansion still stands on at the corner of 7th Avenue and Clarkson Street. Denver City and Auraria flanked the Highland area. There was no law in town, and a wild west atmosphere prevailed. Women would often have their shotguns close at hand while gardening or hanging the wash. In fact, there were frequent duels and murders in the Highland area, resulting in hangings at 15th Street bridge. 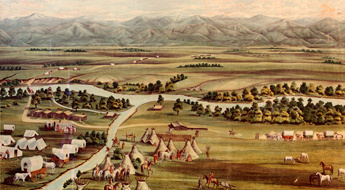 In 1859, the rival Auraria and Denver City decided that the best strategy to combat the constant warfare for dominance was to merge. In the merger they also swallowed up Highland. The Denver Children’s Museum and the Downtown Aquarium now reside on what is left of Highland.